Much of the literature on performing estimation for non-Gaussian systems is short on practical methodology, while Gaussian methods often lack a cohesive derivation. Bayesian Estimation and Tracking addresses the gap in the field on both accounts, providing readers with a comprehensive overview of methods for estimating both linear and nonlinear dynamic systems driven by Gaussian and non-Gaussian noices. Featuring a unified approach to Bayesian estimation and tracking, the book emphasizes the derivation of all tracking algorithms within a Bayesian framework and describes effective numerical methods for evaluating density-weighted integrals, including linear and nonlinear Kalman filters for Gaussian-weighted integrals and particle filters for non-Gaussian cases. The author first emphasizes detailed derivations from first principles of eeach estimation method and goes on to use illustrative and detailed step-by-step instructions for each method that makes coding of the tracking filter simple and easy to understand. Case studies are employed to showcase applications of the discussed topics. In addition, the book supplies block diagrams for each algorithm, allowing readers to develop their own MATLAB® toolbox of estimation methods. 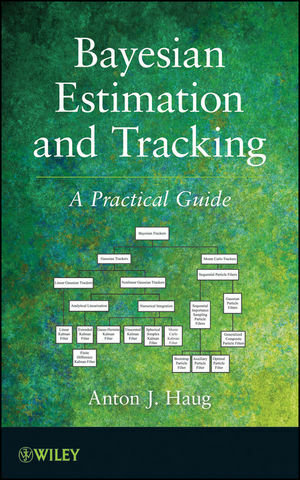 Bayesian Estimation and Tracking is an excellent book for courses on estimation and tracking methods at the graduate level. The book also serves as a valuable reference for research scientists, mathematicians, and engineers seeking a deeper understanding of the topics. ANTON J. HAUG, PhD, is member of the technical staff at the Applied Physics Laboratory at The Johns Hopkins University, where he develops advanced target tracking methods in support of the Air and Missile Defense Department. Throughout his career, Dr. Haug has worked across diverse areas such as target tracking; signal and array processing and processor design; active and passive radar and sonar design; digital communications and coding theory; and time- frequency analysis.